Over the next decade, when baby boomers finally start to age into senior housing en masse, they’ll bring with them a host of new needs and desires—and if senior living providers don’t take heed, they’re at risk of becoming obsolete. That’s because, unlike some of their predecessors, many baby boomers simply won’t be happy with “three hots and a cot,” so to speak. In addition to high-quality accommodations and care, they’ll also want to continue exploring their passions and making a difference in the world, according to Robert G. Kramer, founder and current strategic advisor at the National Investment Center for Seniors Housing & Care (NIC). “I think in the future, state-of-the-art communities for our elders will be known by what the residents presently do, not by what they did,” Kramer told Senior Housing News. That’s not to say care needs aren’t important, however. As people age, it’s a simple fact of life that they’ll need more help. But that doesn’t mean senior living communities need to focus solely on medical or health care. Instead, senior living providers should learn their residents’ backstories and preferences, and then create personalized programming that takes those things into account. That way, they can provide opportunities for meaningful engagement without having to appeal to the masses or implement “dumbed-down” activities, as Kramer said in March. Already, some senior housing and programming providers—such as Front Porch and EngAGE—have experimented with this approach. It’s not always easy to take every resident’s personal stories into account, especially when communities might have hundreds of unique individuals living under one roof. One possible solution is to specialize in attracting certain kinds of people, like artists, educators or military members. 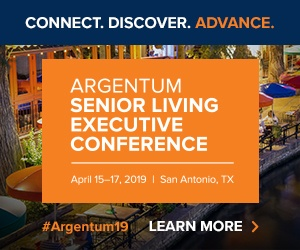 Specifically, Kramer envisioned a day when many more senior living communities have activities or programs meant to give those likeminded groups of people a chance to pursue their passions. Those communities would offer not only high-quality care, but also plenty of opportunities for real, purposeful engagement—even perhaps part-time jobs with paychecks. The next decade will be a time of trial-and-error in the senior living industry, with providers testing creative new approaches to meet the demands of the baby boomers, he said. But while most are still trying to come up with the right formula for long-term success, there are some examples of senior living providers that have applied these forward-thinking concepts today. One example of a community that currently caters to specific kinds of people is Villa Gardens, a Front Porch continuing care retirement community (CCRC) in Pasadena, California. Front Porch is headquartered in Glendale, California, and manages and operates 10 retirement communities throughout the state. The community was founded in the 1930s as a home for retired teachers. Even now, almost one third of Villa Gardens’ more than 200 residents are retired professors, teachers or people who previously worked in the field of education, according to Dmitry Estrin, the CCRC’s executive director. Villa Gardens’ administrators have nurtured the CCRC’s ties to the teaching community. At the heart of the building lies a library stocked with books, a space that also serves a hub for lifelong learning and socialization. The community also offers its residents many ways to share their knowledge, such as lectures, resident-led research and education-focused summer camps with local kids (pictured above). To Kramer’s earlier point, these are not activities arranged for show or to appeal to the masses. These are real opportunities for residents to continue doing the very things they were passionate about during their careers. Specialization in senior living doesn’t need to revolve around professions, either. EngAGE, a non-profit organization that provides arts and wellness programming in 45 senior, affordable and intergenerational housing properties across three states, helps older adults focus on their creative side. EngAGE partnered with Meta Housing on the developer’s affordable “artist colony” projects for seniors, of which there are currently seven in operation. In those communities, residents have an outlet for their creative pursuits, such as writing, painting, performing or drawing. One of the main advantages of offering robust creative programming is that it helps battle social isolation, according to Tim Carpenter, founder and CEO of EngAGE. Like Kramer, Carpenter, too, envisions a day when more senior living communities foster their residents’ lifelong passions.